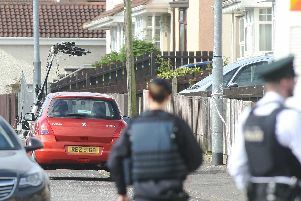 A number of homes have been evacuated in the Bogside to allow fire crews investigate a strong smell of gas hours after a car was apparently set on fire in the same area. The Northern Ireland Fire Service confirmed three fire appliances remained at the scene with Firmus Energy engineers at noon on Tuesday following a call out to a suspected gas leak at 10:32 a.m. Earlier, at 4:15 a.m. two fire applicances attended the scene of a car fire in the same area. “Firefighters dealt with a car on fire which spread to the exterior of a two storey mid terrace property. “A man in his 40s was treated for burns at the scene but did not attend hospital. “The cause of the fire is being treated as deliberate. The incident was dealt with at 5.17am,” a spokesperson said. Independent Colr. Gary Donnelly said the cause of the car fire was still unknown. Speaking to the ‘Journal’ shortly after visiting the schene, Colr. Donnelly said: “There was a fire in a car on the street earlier this morning and one of the houses is badly scorch damaged. “A fellah was in his home but luckily his nephew managed to get in the back of the house and get him out safely. Colr. Donnelly said it was as yet unknown whether the car fire was related to the ongoing gas alert. “There was a strong smell of gas in the area and the fire service are down there now and have cordoned off the street to allow engineers dig and determine the cause,” said the local councillor. Sinn Féin Councillor Kevin Campbell said: “I would like to commend the quick actions of the car owner in his efforts to stop the fire from spreading further despite the dangers he faced.It must have been a very frightening experience.